Behind-the-scenes in Design Capstone Project (CAD 280). 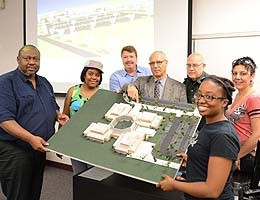 Inside the classroom: Students in Tidewater Community College Professor Jean-Claude Guilbaud’s class don’t just talk about designing a building; they complete the steps necessary for a real-world project complete with detailed architectural renderings. What began with a brainstorming session last fall when the students were presented with a tract of open land in the Brenneman Farm section of Virginia Beach became WeCare Daycare an innovative facility for preschool and school-age children, ages 4 through 12. The students named their company the Tidewater Concepts and Design Group and worked in teams on the architectural, structural, mechanical and site designs, using Revit software to create renderings of a 52,075 square-foot facility. WeCare Daycare features an atrium in the center of the building allowing for substantial natural light, classrooms, a cafeteria, a media room, conference rooms, a gymnasium, an outside play area and ball fields. The students presented their $11.4 million bid with documentation including a site plan, zoning and elevation detail, roof plans, aerial views and a 3-D physical model.